The Cement and Concrete Institute launched a table for trial concrete mixes from 10MPa to 40MPa. 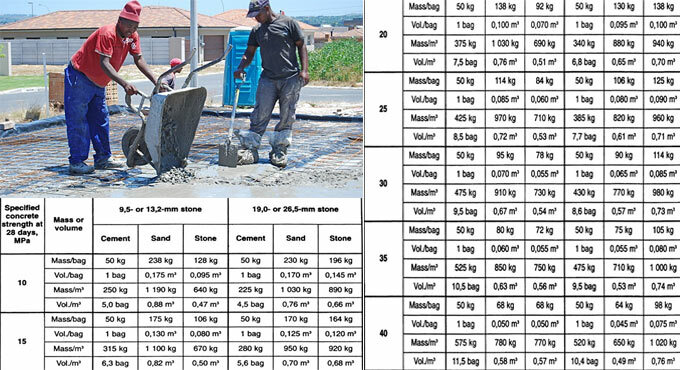 The table comprises of concrete mix ratios by weight, volume and mass. These trial mixes are useful and can be applied for verifying your concrete prior to utilize it in any construction work. The project manager or other concerned person should always evaluate and sanction any concrete work that is initiated on your site. The mix proportions provided in the table by mass and volume, with various size stone which are compatible with several strengths of concrete. To make the mixture executable, the water should be added to the mixture. The discrepancy among various cements and aggregates is not considered with these mixes. Ensure that the water is retained collectively with the mix and is not permitted to drain/run away since it may lead to weaker mix. NOTE: These proportions are chosen on the basis of the assumption that a CEM type cement having strength class 32,5 will be applied. Cement having strength class 42,5 or greater will produce a stronger concrete but may be less inexpensive. Cements containing high extender contents (eg CEM 11/B or CEM 11) will form strength gradually and require special attention with curing. Masonry cements adhering to SABS ENV 413-1 should only be utilized with specialist advice. A mix that is produced based on this table and to the desired consistence, should be evaluated for checking the workability and stone content prior to be utilized on a large scale. Quantities of materials provided per cubic metre of concrete are net. The wastage of 3% on cement and 10% on aggregates are included. Given below, the details of nominal mix proportions (also known as the ratios of mixes) for several strength categories, with a 19mm stone.